CASTRO MARIM, Portugal , Sep 24 2012 (IPS) - A promising alternative in Portugal’s profoundly depressed domestic market are incentives for traditional exports which, due to their high quality or uniqueness, do not face fierce foreign competition. “Flor de sal”, the country’s premium hand-harvested sea salt, is one of these products. Many economists, including those who support the right-wing government, recommend incentives for sales of fine products for which Portugal is known, such as footwear, oranges, cork, wine and sea salt. The crème de la crème of sea salt – known as flor de sal in Portuguese and as the caviar of salts in English – is used by chefs in the world’s finest restaurants. It is the very top layer of salt harvested on the coast. The harvesting process is one example of a traditional activity that is making a comeback, as a successful alternative in the face of this country’s severe economic crisis. IPS visited the salt flats at Castro Marim, 330 km from Lisbon, in the southern region of Algarve. Jorge Filipe Raiado, the owner and manager of the small but highly-respected company Salmarim, found his business niche when he began to produce and export flor de sal, which is much more profitable than common table salt. Sea salt is generally only harvested during the summer months. “The expansion of exports is essentially driven by chefs, who demand top-quality products for their dishes, such as flor de sal,” Raiado told IPS. The recession, which is being felt throughout most of Europe, has hit Portugal and neighbouring Spain – this country’s main trading partner – especially hard. What exactly is flor de sal? IPS asked. “When milk boils, there is a difference in temperature between the liquid and the air, and a thin skin of cream forms, which easily disintegrates if you squeeze it between your fingers. Flor de sal is exactly the same thing,” Raiado explained. 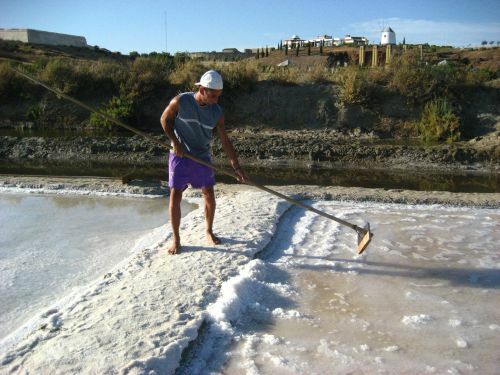 These tiny salt crystals, which form a crust on the surface of the water, are raked by hand every day, so that only the freshest, uppermost crystals are harvested using artisanal methods. They are then dried in the sun, and no bleaching, mechanical processes or chemicals are involved. Although they feel dry, they contain a minute amount of moisture. Raiado said flor de sal does not change the taste of food, but produces an “explosion of flavours,” unlike bland table salt. One kilo of flor de sal costs around 25 dollars in Portugal. But it can fetch up to 130 dollars abroad, which makes exporting it to Spain, France, Poland, Germany, the United States, Canada, Denmark, Switzerland, Belgium, the United Kingdom and Hungary – the principal importers of this country’s flor de sal – a lucrative business. The main competitor in the production of flor de sal is France, where it is known as fleur de sel. In 2010, the last year for which data is available, Portugal produced 44,574 tonnes of sea salt. Salmarim’s sales are not large-scale – eight tons of flor de sal a year. But thanks to Raiado’s creativity and tenacity in finding a way out of the crisis, his business has frequently been cited as an example of success in the face of adversity. The internationally-renowned chefs who use gourmet brands of flor de sal are the best advertisement for the product. Today, Hungarian caviar is packed using flor de sal purchased from Salmarim. Sea salt is one of the export success stories that are helping to buffer the effects of the global recession in Portugal, which is suffering its worst economic crisis since the return to democracy in 1974, after 48 years of dictatorship. According to Justice Ministry statistics released in July, 10,379 companies closed their doors in the first half of the year – 33 percent more than in the same period in 2011. Since Prime Minister Pedro Passos Coelho took office 15 months ago, his conservative government has done everything in its power to follow the dictates of the European Union, International Monetary Fund and European Central Bank. In exchange for a 110 billion dollar bailout for Portugal, the so-called “troika” of creditors required austerity measures such as steep wage cuts, sharp tax hikes, and a reduction in employers’ social security contributions and an increase in workers’ contributions, on the argument that Portugal had to become more competitive by offering cheap labour. This strategy of “increasing poverty in order to compete can only exist in the heads of dogmatic economists,” Rui Tavares, a Green member of the European Parliament, wrote in an op-ed published Monday Sept. 17 in the Publico daily newspaper. All the projections by the EU, the IMF and the Passos Coelho administration have failed, and the economy is still in a downward spiral, with a 15.8 percent unemployment rate, the highest-ever in Portugal. In 2011, exports represented 35 percent of Portugal’s GDP, according to a study by the Banco do Espirito Santo released early this year. They are expected to account for 37 percent of GDP this year. Figures from the Banco de Portugal and the National Statistics Institute (INE) indicate that in the first seven months of the year, exports of goods and service totalled 48.5 billion dollars, 6.5 percent more than in the same period in 2011 – the best performance in five years. In the first seven months of 2011, the trade deficit amounted to 8.5 percent of GDP. But in the first seven months of this year, it dropped to 1.8 percent. The last time Portugal had no trade deficit was 70 years ago. Raiado’s company is small, which means it does not by itself have an influence yet on employment or the deficit. But it is growing, and it shows that traditional and gourmet exports are worth their salt in times of crisis.